Today is Memorial Day, and though most Americans are quite familiar with the song “Taps” I realized I didn’t know much about the history of it. In fact, in doing research for this post, I also learned that this year marks the 150th anniversary of this, America’s most famous bugle call. Memorial Day is a day to honor those who gave their lives serving our country, and I thought it would be appropriate to learn more about this famous and poignant song. There is a great website called TapsBugler.com that has information all about Taps, the history of bugles, and the role of bugles and buglers throughout American history. The site is hosted by Jari Villanueva, a bugler and bugle historian, and former curator of the Taps Bugle Exhibit at Arlington National Cemetery. Mr. Villanueva wrote a fantastic essay on Taps, called “Twenty-Four Notes That Tap Deep Emotions: The Story of America’s Most Famous Bugle Call,” and there is a good-length excerpt from it on the site. There are several stories as to the origins of the song – but the most historically-backed, and the one on TapsBugler.com is that Taps is actually a reconfiguration by General Daniel Butterfield of an older bugle call, “Tattoo” which was used to call soldiers to day’s end. “Taps” wasn’t titled that until years after it was played for Butterfield’s brigade in 1862, but it gained popularity throughout the military. In 1891 it was listed in the Army Infantry Drill Regulations as a mandatory call to be played at military funerals, although it was unofficially used for many years before that; a final call of “Taps” signalling the day’s end for a fallen soldier. 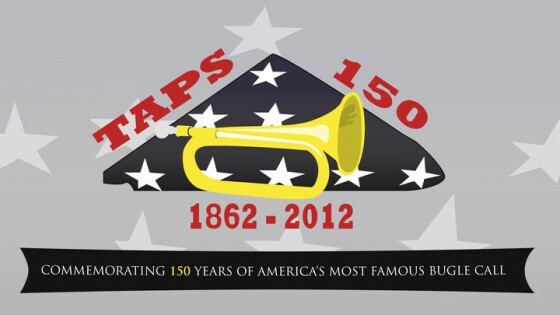 If you have time and an interest in this piece of American history, I’d highly recommend reading more about Taps, its uses, and origins on TapsBugler.com. I thoroughly enjoyed reading the information I found there, and was glad to find such a great resource online.